My sculpture-making practice began by covering found-object plaster animals with glitter from a growing collection of colored powders and pigments. The dazzling color and reflective light of glitter is uniquely compelling. I choose to work with this irresistible material because of its association with joy and optimism. I began to wonder how this material would illuminate an object with strong symbolic meaning. 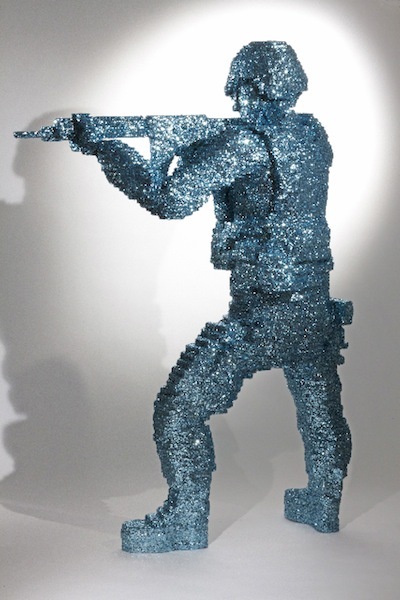 Observance of the 10-year anniversary of the war in Afghanistan in September 2011 provided inspiration to complete this larger-than-life-size figure modeled on a plastic toy soldier. The sculpture is over 6’ tall, made of foam, acrylic, plaster, resin and over 10 lbs. of glitter. This installation is dedicated to organizations working towards peace. 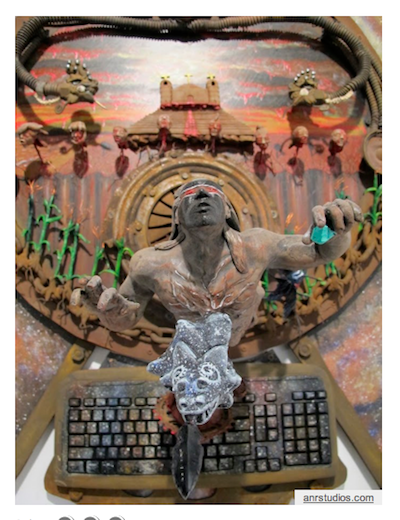 “Recovering Consciousness” is a sculpture made from clay and repurposed salvaged objects, exploring his own interpretation of the return of Quetzalcoatl as the return of our consciousness. 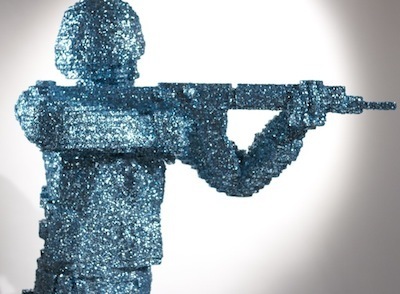 Alfonso’s sculptural pieces are compelling social commentary on the human condition in the 21st century, referencing and blending with Mexican cultural mythologies. Viewed from directly in front, the composition flattens, and appears to be a two-dimensional image in three-dimensional space creating an illusion of a three-dimensional composition in a two-dimensional space. "The forms and placement of fungi and lichens often suggest languages to me, perhaps messages conveyed by coexistent species that humans are unable, unwilling or too intellectually arrogant to decipher, messages concerning our beleaguered planet." The artist makes her own paper from plant fibers. Here she uses kozo, the inner bark of a mulberry tree, and abaca, a fiber from the stems of banana leaves. She uses this medium because it is not destructive to the environment. The forms she represents here are plants called cup fungi which often grow in burnt, wasted environments. Melissa presents a call from nature that it is in distress, and needs to be rescued from human destruction. Philip Hartigan is a multimedia artist working with personal narrative. Día del Padre (Father’s Day) brings together work related to the death of his father in 1967: four short stop-motion animations with narrative (previously shown in galleries and festivals in the USA & the UK); and a new photographic piece. The Spanish phrase for Father’s Day was chosen in homage to the neighborhood in which the gallery is located, and to reflect the international character of the collaborations. On August 10th there was a live reading of short pieces by artists and writers relating a single memory of each person’s father from the window gallery. A microphone broadcast live to the street. Contributors include UK writer Vanessa Gebbie (winner of many awards for her short stories); UK-based poet Carrie Etter (whose verse has appeared in Poetry Review, the Times Literary Supplement, The New Republic); artist/writers Dianne Bowen, William Evertson, Tullio DeSantis, and Susan Shulman; and students and alumni of the Fiction Writing program at Columbia College Chicago (Wyl Villacres, Ben Kramer, Cyn Vargas, Gibson Culbreth, Gail Bozzano, Greg Baldino). years, i.e. pieces of wood and metal, like old organ pipes, and household items like chairs, cribs, mirrors, etc. These female figures are made from found objects. I love the challenge of figuring out how to physically and metaphorically piece stuff together to find a new composition. The secondhand household things that make up the figures all represent objects that once had a purpose no longer needed. Spoons, baskets, egg beaters, drill bits and more bring some whimsey and sacredness to the female form. The figures stand at attention, looking out at the action on the street and beckoning to the passersby. Behind them I hung two of my paintings, as a back drop, but also to reference scenes from other windows. The paintings are from a series called “Views from My Garden”. Deborah Hirshfield works with silk to depict various physical and emotional torments. By twisting, tying, knotting, adding and removing dyes, she seeks not only self-expression but exorcism and healing. Laura and Leslie Hirshfield create collages uniting their individual art disciplines of cloisonne enamel and drawing and painting. 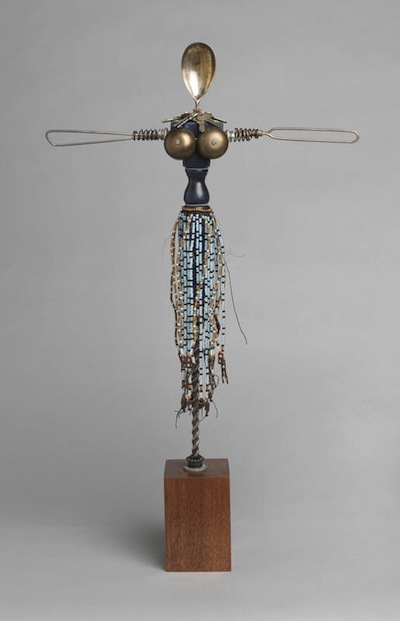 Their works evolved from collections of art materials accumulated over the years – unset enamels, scrap metal, wire, and discarded jewelry in combination with handmade paper, ink, pastel, and paint. It’s an ongoing, fun, and exciting collaboration. That which seems to depict nothing in particular, can actually hold everything. This idea of “nothing” leading to “everything” reflects my understanding of the mysteries within my life’s journey. As I am painting I consider opposing forces of control/spontaneity, light/dark, horizontal/vertical and the interplay of colors that harmonize or contrast. Encaustic painting can be both fluid and solid. My art contains basic structures, layers, fragments and edges. I explore these components intuitively. This structure undergoes a metamorphosis from the planned to the unplanned as the layers of wax are scraped, smoothed, and incised. Layering, scraping and scoring become metaphors for time and memory within the paintings. I work intuitively to build complexity and nuances of color and texture. At some point, accidental effects occur. Either they happen spontaneously, or I work in a way that is less controlled and seek to bring them about. This way of working is intended as a metaphor for the divergence between human intellect and emotion. The transformation from controlling our emotions to letting go is one that can occur spontaneously in ways that are unpredictable. As I work on each painting I am bringing the separate elements together to create a whole. The ultimate meaning remains purposefully open-ended. For me, embracing these unpredictable discoveries reflects reality more clearly than what could be expressed through a closed narrative or concept. Julia Hürteris an artist who works with text and images culled from popular media. She lived in Columbus, Ohio for the last year and has collected American quotes that she found in her daily junk mail. Divorced from their visual cues, the messages are a distillation of American marketing culture: cajoling, demanding, and cheering. In between these, you can find several quotes from Abraham Lincoln, a very wise president. They stand in stark contrast to the banality of American marketing. During the month of February, ART ON ARMITAGE window gallery will present an exhibition of 3 extra large photographic still-lifes created by Stephanie Dean, picturing the particularly Midwestern Meals her friends and acquaintances have eaten. Foods such as meatloaf, mac & cheese (with tuna) and apple pie with a "special" topping are treated with the classical lighting and formal compositions usually associated with traditional Dutch still life painting. Each piece is named after the person who regularly eats the meals, and is a natural evolution from Dean's famous "Modern Groceries" series. ©Stephanie Dean 2012. I am working with trash - stuff that can’t be or isn’t recycled, mostly because it is not financially profitable. “Endless Columns” are made of plastic jar lids and bottle caps. The colors are beautiful, but the trash is ugly. I hope to make people aware of just how much garbage we are throwing onto the earth, especially plastics. Worse, they are made from petroleum, exactly what we are fighting wars for. People are dying so we can have disposable bottles and bags. Meanwhile, I hope to take things that would otherwise go into a garbage dump and make beautiful environments from them.